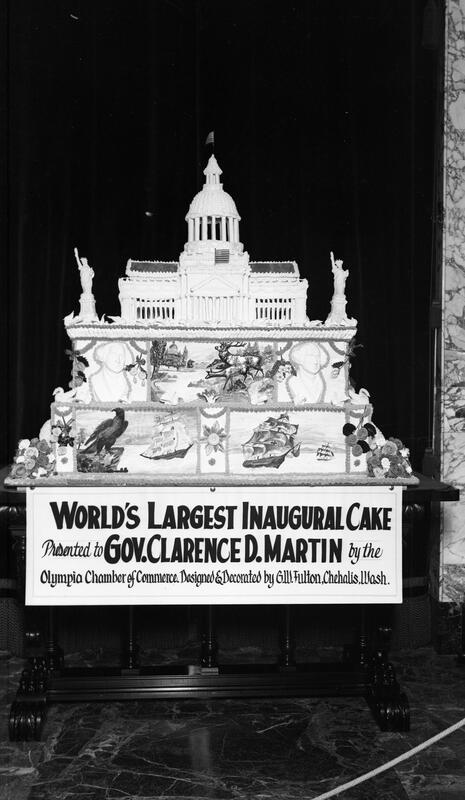 This 1933 photo features the cake for Washington State Governor Clarence Martin's inauguration to his first term in office. Source: Susan Parish Photograph Collection, 1889-1990. Clarence Martin was born and raised in Cheney in Washington Territory, where the Eastern Region Branch Archives and Digital Archives are located now. He graduated from the University of Washington in 1906, and joined his father in running the Cheney Grain and Milling Company. From 1928 to 1933 Martin was the mayor of Cheney, and while still in office, was elected governor of the state of Washington in 1932. He was known as the "people's governor" for his strict frugality in government spending and oversaw large economic projects such as the Grand Coulee Dam to put people to work during the Great Depression. Source: Susan Parish Photograph Collection, 1889-1990.